Last week I mentioned the Jewelry Challenge that the talented and lovely Lorelei posed to her blog readers. As I mentioned, I signed myself up for the challenge and today is the reveal of our necklaces. 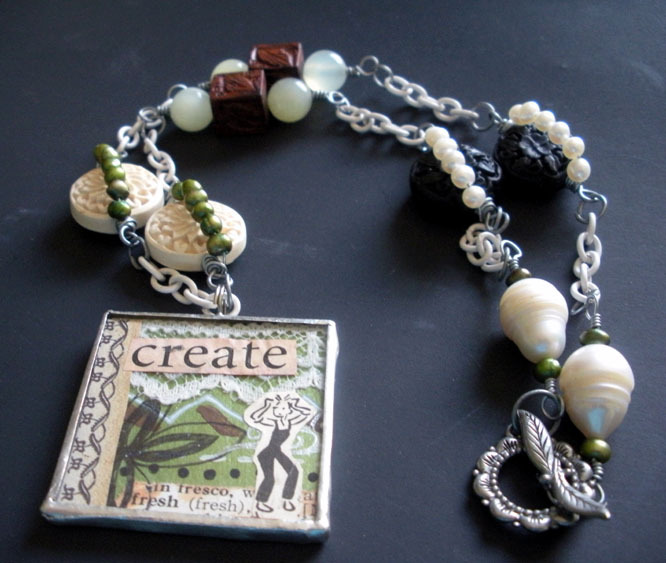 While the beads seemed to flow together easily, the challenge for me was to work the white chain into my design. As part of the rules, we could use any two other types of beads, any clasp, and any focal. I ended up only using one other bead type, white freshwater pearls. The clasp is a flower/leaf toggle. For the focal, I decided to do what I do best and made a soldered collage pendant to compliment the colors of the beads Lorelei chose. And this is what I produced. Now that you've seen mine, below is a complete list of links to the other designers who played along with this challenge. Hop on over to their blogs and see how our designs differ with the same materials. I know I can't wait to see them all! As well, please visit Lorelei's blog to see pictures of what she and some other designers (without blogs) also created. How fun is this!!?? I want to send a BIG THANK YOU to Lorelei for hosting this challenge and blog hop. I really had a lot of fun using materials I didn't pick out to fuel my creativity. Thanks so much, now get your booty over to those other blogs! *Love* that focal !!! Wasn't this a blast? I had nightmares about that chain and everyone did such a great job with it. Happy Blog Hopping! 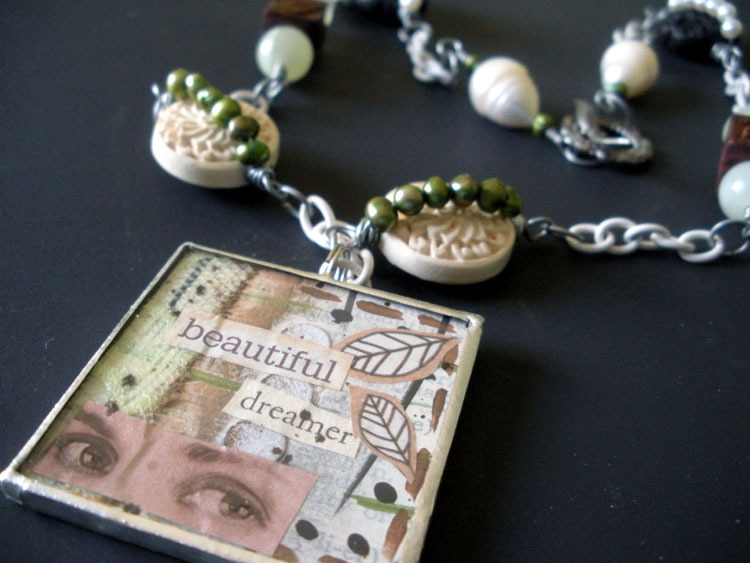 Love your focal and your use of silver with the white chain! That pendant goes perfectly with the colors and design of this piece! So awesome. :D I'm digging its message and lovely textures. Lovely work! you did a splendid job incorporating the chain! Beautiful pendant too! Thank you all so much. I had a ton-o-fun with this challenge and can't wait for another!! i love this necklace and the way you broke up the white cinnabar bead with the green pearls..
Love your pendant and the fact that it has all the colors of the kit. I also like how you used your white chain. I might venture into a second round with a pendant. 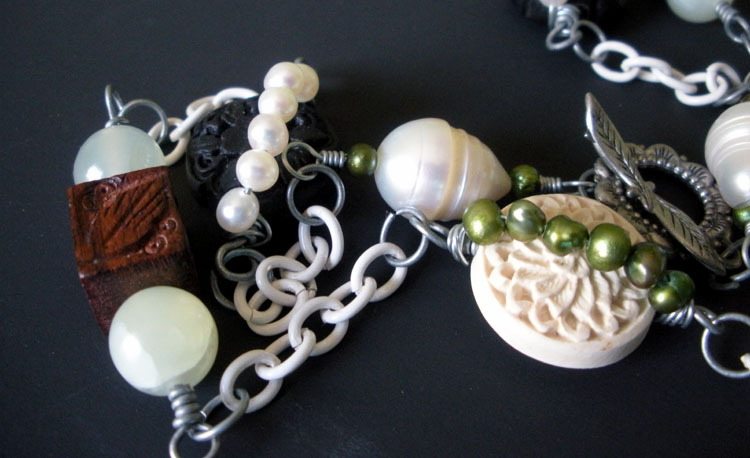 Okay, I love how you used the green pearls to accent the white cinnabar! Talk about cool :) And your focal, divine! Wow how Original and Thoughtful the Design youve done. Very Intresting and really wonderful! Lovely. Great use of the white chain. I love your focal and how you strung the green pearls over the white coins! Great job! Gosh, I absolutely love your focal! So pretty. Lovely necklace altogether. that is great! love that pendant! I would wear your jewelry! You did a nice job! Ohmygoodness!!! I'm loving the love! Thank y'all so VERY much!! Great texture! You've done a brilliant job of bringing it all together. The pendant fits the piece marvelously! awesome results - love your pendant! so sweet. i love the use of the green pearls to 'trap' the carved ivories. I love your focal bead and the interesting way you wrapped the pearls. Very pretty! What a beautiful interpretaion of this challenge! 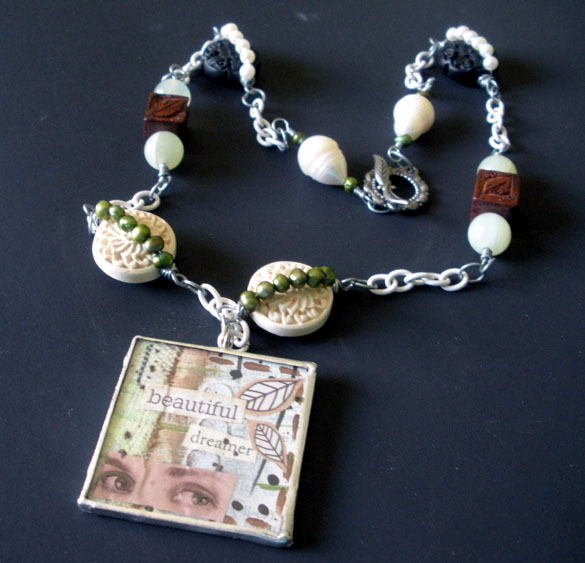 I LOVE your focal, and the way you strung the green and white pearls around the cinnabar beads adds so much texture - beautiful! Nice! I love our focal. It is fun to see what everyone has created with the same materials. I lovelovelove that pendant! What a super cute super fun necklace. Love what you did with this! It was so funny, reading on blog after blog that the artists hated the white chain! You made it work,though! I will say it once again, I love your stuff! I think it's all been said, and I agree your necklace is beautiful... what a fantastic art piece to wear proudly. And I agree too that the focal is just wonderful!